Many of us, Surgeons, were confronted in situa- tions where salvation becomes questionable. It is always unpleasant to perform such operations creating devastating effects on the victim itself. Multiple attempts at saving a highly morbid limb can become costly and as well a menace for the life of the patient. There is always a dilemma: Reconstruct or Amputate. The evaluation of a Mangled extremity begin on the site of the injury and require consideration to the extend and the severity of the vascular injury, the bone and the soft tissues destruction, the duration of the limb ischemia with the present health status of the victim. All taken in consideration, the goal of the treatment is to produce a functional and painless residual limb. Many methods have allowed trauma surgeons to evaluate those extremities at risk but two practical guides are presently the most common used: The Mangled Extremity Syndrome Index (MESI) or (PSI) and the Mangled Extremity Severity Score (MESS). The MESS, developed by Johansen, is more practical and more refined. Those guide are used to supplement the clinical judgment of the surgeon and look at the injury severity (Energy of Transfer), ischemia, Shock and Age. 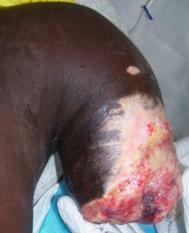 The MESS is highly specific for an extremity that should not undergo amputation. The MESI or the PSI (Predictive Salvage Index) developed by Howe in 1987 look mainly at the level of the vascular injury, the degree of osseous and muscular trauma and the warm ischemia time. Other scores like the Limb Salvage Index (LSI) popularized by Russel in 1991 is similar to the PSI while finally the Hannover Fracture Scale (HFS) considers the viability of the extremity on the degree of the open fracture with vascular injury (Gustillo Type 3C). Many companies are on site around the country like Hanger, Handicap International and many countries have provided help. Many hospitals have initiated set up for fabrication of prosthetics on the spot. Many have claimed success stories and miracle in Haiti allowing some to play football and others to dance professionally. They are certainly rendering life easier for these amputees who can benefit from the care but the rate of stump infection is alarming. We will need more time to appreciate the consequences of so many wounds dehiscence, Osteomylitis, etc… before claiming victory…..
Trauma East Practice Management Guidelines. 2- M. Jeminez, Assistant Professor Lutherian General Hospital-University of Chicago Medical School, The Mangled Extremity Limb Salvage vs Amputation. 3- Dr. Dirschl and LE Dahners, The Mangled Extremity: When Should it be Amputated Journal Am academy of Orth. Surg. 5- Durham RM, Mistry BM, Mazuzki JE et AL, Outcome and Utility in Scoring Systems in the management of the Mangled Extremity, Am. J. Surg. 172:569:1996 6- Russell WL, Sailors DM, Whittle TB, Fisher DF Jr, Burns RP. Limb Salvage vs Traumatic Amputation. A Decision based on a seven-part predictive Index Ann Surg. 1991; 213:47 7- Howe HR Jr, Poole GV, Hansen KJ, Clark T et AL, Salvage Extremities following combined orthopedic and vascular Trauma. A predictive salvage index. AM Surg. 1987; 53:205-8.